You are currently browsing the category archive for the ‘ECT’ category. Ray Sandford doesn’t want to do this. On a sunny yet cool mid-April morning, the pear-shaped 54-year-old emerges from the front door of his ranch-style group home in Columbia Heights. Wearing a black windbreaker and gray sweatpants, he grips the handle of his four-pronged cane and plods begrudgingly toward the street. One of Sandford’s caretakers, a large woman wearing all purple, follows perfunctorily behind to see him to his destination. He’s told them repeatedly he doesn’t want to do this. Molly Hogan is a nurse who is coordinator of the MindFreedom Bay Area Affiliate. Molly is shown here with photographs of her mother who had forced electroshock (lower left), grandmother who had a lobotomy (upper right) and stepmother who had forced electroshock. Photo credit: MindFreedom. Molly Hogan supporting victims of psychiatric torture. MindFreedom International and California Network of Mental Health Clients co-sponsored a peaceful protest of the American Psychiatric Association Annual Meeting today Sunday, 17 May 2009, in front of the Moscone Center, San Francisco. SAN FRANCISCO, CA: As psychiatrists arrived at the Moscone Center in San Francisco for their Annual Meeting they were greeted by survivors of psychiatric human rights violations and their allies, a powerful sound system, and stories of psychiatric abuse and survival. About 50 protesters from five states participated in a “Festival of Resistance” co-sponsored by MindFreedom International and California Network of Mental Health Clients (CNMHC). Calling it a “Festival of Resistance,” the event began with a skit using a 10-foot hypodermic needle prop that said “Mad Pride” on one side and “Truth Hypo” on the others. About a dozen guerilla theater participants in white coats bowed repeatedly chanting, “Oh Big Giant Hypo, Please Help Us Be Normal!” But soon the Big Giant Hypo, and the protesters, were giving the APA meeting itself a truth injection. The protest was part of a growing “Mad Pride” movement that has been seeking change in mental health care for 40 years, and is finally gaining more public attention. The focus of the day was about individuals who have experienced abuse in the mental health system, supported by their allies. One speaker was Molly Hogan, a nurse who is the coordinator for the MindFreedom San Francisco Bay Area Affiliate. Molly told the story of her mother who had forced electroshock. Molly is shown here pointing to her mother. On the top of Molly’s sign is a photo of Molly’s grandmother, who had a lobotomy. For more photos of the Festival of Resistance click here. Frank Blankenship of Florida, MindFreedom Affiliate Support Committee Chair. Delphine Brody, a protest organizer, and client/survivor advocate, Mental Health Services Act Director, CNMHC. Leonard Roy Frank, activist, author & electroshock survivor. Al Galves, PhD, of New Mexico, psychologist, mental health consumer, author, MFI board member. Ashley McNamara, artist, writer, and activist with The Icarus Project & Bay Area Radical Mental Health Collective. David W. Oaks from Oregon, psychiatric survivor and director of MindFreedom International. Ron Unger from Oregon, mental health counselor and coordinator, MF Lane County. Sally Zinman, long-time client/survivor activist. An open mike was held that included a number of other speakers. The protest, held under a hot sun, was endorsed by CNMHC Social Accountability Work Group, Bay Area Radical Mental Health Collective, and The Icarus Project. “The APA tells lies to sell drugs: it’s in need of a truth injection, to cure it’s unbalanced propaganda! The action today was completely independent, with no connection to a larger protest yesterday, Saturday, 16 May 2009, by the Citizens Commission on Human Rights (CCHR), an organization that is sponsored by the Church of Scientology. MindFreedom director David W. Oaks said he was very grateful for all the support for today’s protest, 17 May, from so many sources. To see more photos of the APA 2009 protest click here. To view the original news release for the event click here. To download a PDF of the news release click here. To download a PDF of the original flyer for the event click here. 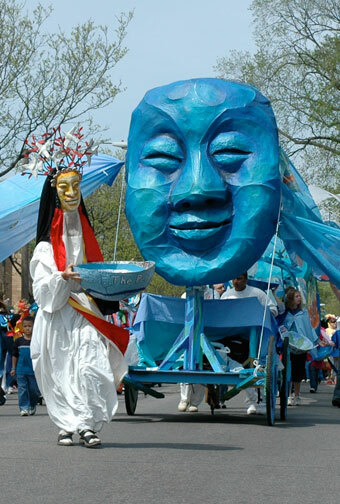 Then at noon, Sunday, join MindFreedom at the Green Medicine booth at the enormous MAY DAY PARADE FESTIVAL, ask for Amy. We’re in the program. This is a fun event, so we’re using humor. Prepare to do roving guerilla theater to “Screen for Normality” with Al & David, in a an easy street skit created by clown troupe of Patch Adams. We have doctor outfits for all, and hundreds of flyers about how nobody is normal… and how Ray is getting forced electroshock. After a post-protest lunch, about nine MindFreedom activists visited a number of Ray’s [who has received over 40 forced electro-convulsive therapy shocks.] elected officials. The delegation discovered special interest from Ray’s State Representative, Carolyn Laine, who met with the delegation for about half an hour. Ray is a constituent of Rep. Laine, who pledged to work with the new ECT Work Group that has been formed by several mental health agencies because of the Ray Campaign. See ACTION below about how to thank Rep. Laine! Please *THANK* Ray’s elected State Representative Carolyn Laine for personally meeting with the MindFreedom delegation, and agreeing to look into Ray’s human rights! Show Rep. Laine there is widespread support for her taking action, from throughout the USA and the world! ST. PAUL, MINNESOTA: For three hours today, several dozen participants successfully held a peaceful MindFreedom International protest of the ongoing forced electroshock of Ray Sandford, a 55-year-old resident of Columbia Heights, Minnesota. The loud protest was held directly inside the majestic Rotunda of the Minnesota State Capitol in St. Paul, Friday, 1 May 2009. 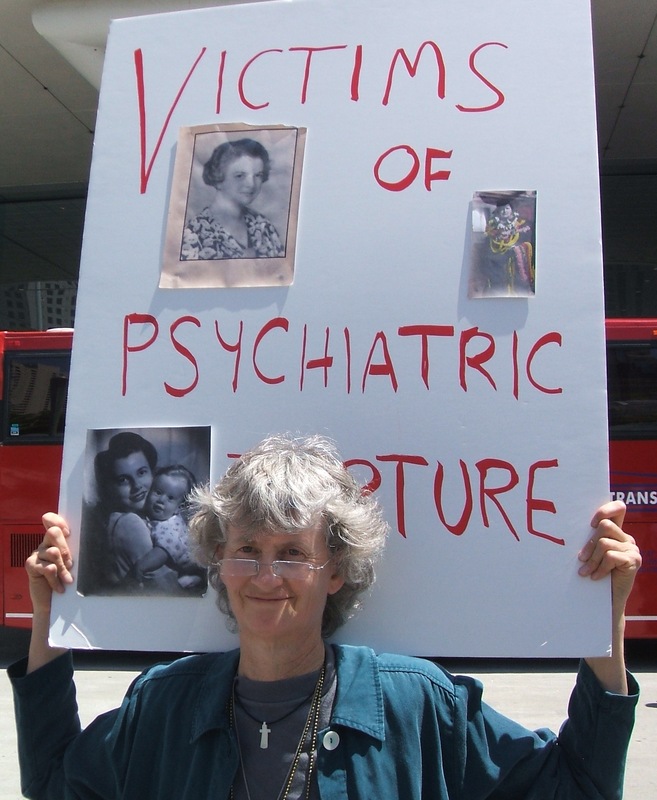 Louise Bouta, long-time psychiatric rights activist and electroshock survivor. Al Galves, PhD, psychologist, author, mental health consumer, and MindFreedom board member, from New Mexico. Daryl Trones, mental health activist and father of a psychiatric survivor. 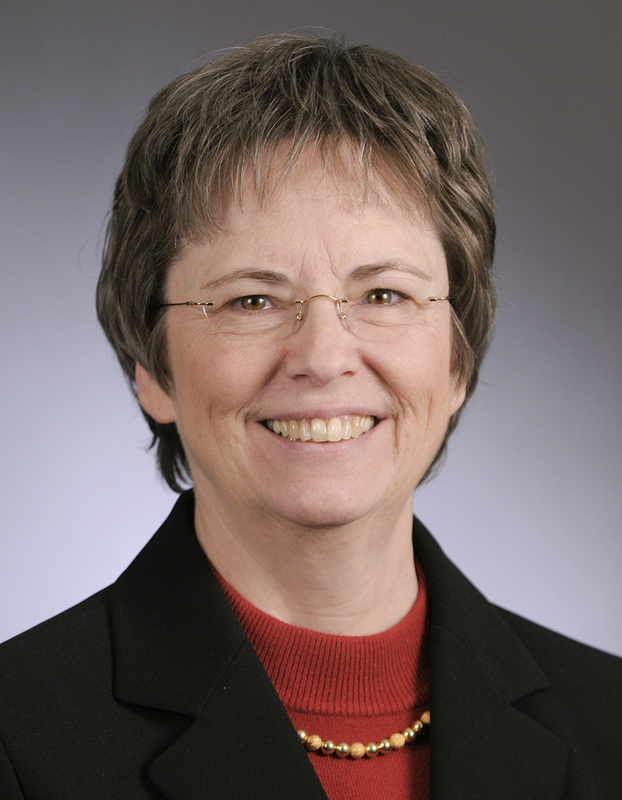 Janet Saugstad, author and psychiatric survivor of the Veteran’s Administration. Amy Storbakken psychiatric survivor and promoter of alternative medicine for mental health. John Wilson, a psychiatric survivor running for Mayor of Minneapolis. Jennifer Padelford, representing the Mental Health Consumer/Survivor Network of Minnesota, who spoke out about the need to hear the voice of mental health consumers/psychiatric survivors. Louis Kayser, a MindFreedom member, drove for hours from Iowa to participate saying, “I have always wanted to be in a MindFreedom protest. I want to go to more protests!” Louis made signs for the event, videotaped the news conference, and even carpooled speakers back to their homes. 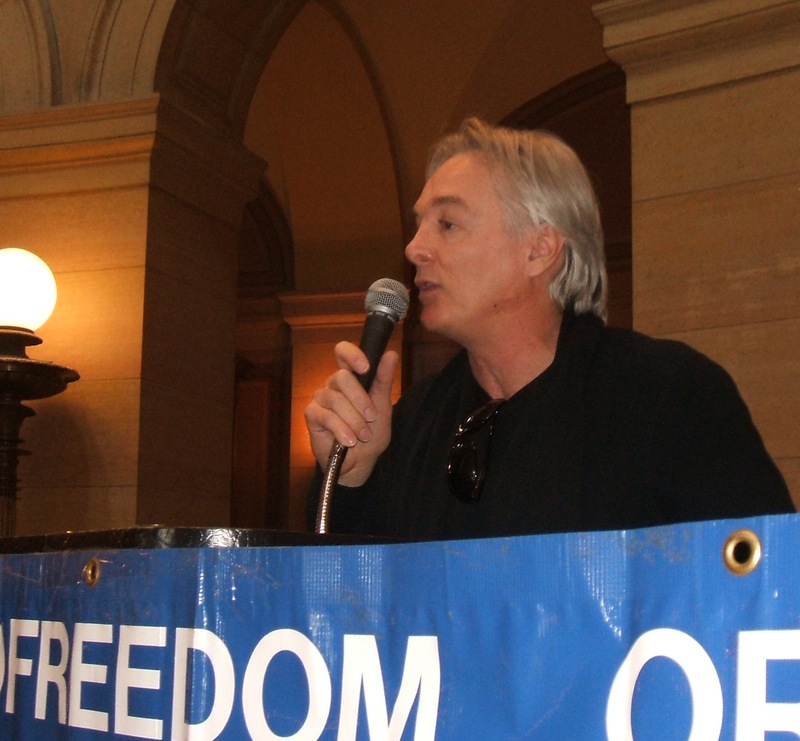 Protest to Be Held in Minnesota State Capitol Rotunda to Stop Forced Electroshock of Minnesota Resident. MindFreedom International announced that it will peacefully protest the ongoing forced electroshock of Ray Sandford, a 55-year-old resident of Columbia Heights, Minnesota. The protest will take place inside the Rotunda of the Minnesota State Capitol building in St. Paul, Minnesota on Friday, 1 May 2009, from 10 a.m. to 2 p.m. A NEWS CONFERENCE WILL BE HELD AT 11 am. shocked. Sandford lives in a residential group home and is under the general guardianship of Lutheran Social Services. “It’s amazing that a man who is supposedly being protected by Minnesota court-appointed guardians and who has been represented in court hearings by a Minnesota public defender is suffering this kind of human rights violation,” said Al Galves, PhD, a member of the MindFreedom board of directors. and Daryl Trones, a mental health advocate. Galves said that electroshock — also known as electroconvulsive therapy or ECT — subjects the patient to as much as 600 volts of electricity for between one-half and four seconds. “It disables the brain,” Galves said. MindFreedom International is an independent nonprofit coalition of psychiatric survivors and others who advocate for the increased availability of safe, humane and effective care for people who are experiencing psychiatric emergencies and who oppose involuntary treatment. MindFreedom can be contacted at office@mindfreedom.org. For more info on the Ray Campaign see: www.mindfreedom.org/ray. Since I just posted that Ray wants his ETC to stop, I thought I would post this. She does a good job of explaining what it is like. Contact Lutheran Social Services. Tell them to STOP shocking Ray. Are you Lutheran? If so SPEAK OUT now! 3. The treatment hurts and is ruining his quality of life. 4. The individual is not a harming himself or anyone else. 5. This is America. What is going on that we can force an individual to receive electric shock treatments? 6. His own mother, who as retired nurse has given people electroshock treatment, is pleading for this painful, hurtful treatment of her son to stop. Ask President Obama to Stop US Funding of Forced Electroshock! Protests in April and May! Ray Sandford was woken up early again this Wednesday morning, 4 March 2009, in his basement room in a small assisted group home north of Minneapolis, Minnesota. As has happened about 40 times before, Ray is escorted against his will and under court order the 15 miles north to Mercy Hospital. He is put under anesthesia, given another involuntary electroshock, and sent home. Ray is not a criminal. Ray’s only offense is peacefully, clearly, repeatedly and reasonably saying “no” to his electroshock. Transformation. Empowerment. Recovery. Human rights. Self-determination. Alternatives. Peer-driven services. Trauma-informed care. Talk live on MindFreedom web radio about President Obama’s mental health plans. MindFreedom monthly live free web radio show on Saturday, 14 March 2009, will feature Judi Chamberlin and Dan Fisher. Who Profits From Ray’s Forced Electroshock? Miracle for Ray… Just for Today? During this delay: How you may easily and peacefully protest Ray’s future forced electroshock from wherever you are. Truly, it’s time for all of us Americans to make a friendly visit or phone call to your local ELCA church. Given all the great and caring Lutherans I know, I feel it is highly likely there are individual participants who will be concerned, or who at least will not reply with sarcasm. Ray Sandford’s forced electroshock today was postponed today. As has happened many times before, early this morning Ray was woken up in his assisted living home and escorted to a psychiatrist’s waiting room at Mercy Hospital north of Minneapolis, Minnesota. As he often does, Ray complained about his physical health. In the past his complaint has not made a difference. This time it did. A medical staff person told Ray his involuntary electroshock was canceled that morning, citing Ray’s physical health as the reason. It’s not over yet, of course. Ray is supposed to have a check-up next week to see if his forced electroshocks may be rescheduled.